This is the blog of writer & illustrator, Robert James Luedke. During the 1990's, Robert created the comic book series: Template, Max Damage and No Justice/No Piece. 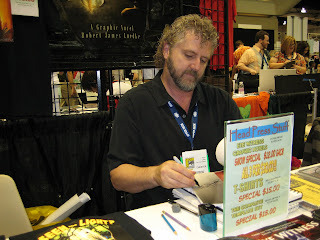 From 2002-2010 Robert created the AWARD-WINNING Christian Graphic Novel series, Eye Witness, which is a unique combination of religious fiction with a modern day action-adventure. 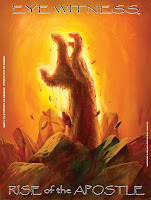 I belatedly wanted to share with you the image created for our Eye Witness: Rise of the Apostle promotional poster image. At this point the poster is only available at my personal appearances in '08 and early '09 (see the schedule on our home page at: http://www.headpress.info/). The design was a joint collaboration between myself and Dallas artist David Rodrigues (www.artlovemagic.com). But the finished painting is all David! David specializes in doing life size painting at get togethers, (corporate, church, events, festivals, etc...) working in acrylics and using a sheet of plywood as his canvas! When I asked him why he worked in that medium, he told me, "hey, have you seen how much it costs to create a six-foot canvas?" But economy of scale aside...working on this medium adds a very unique texture to his finished work. This poster image in particular has proven to be so popular, that at this year's Comic Con International (http://www.comic-con.org/cci/cci_reg.php) people scarfed them up at record pace! In fact, on Thursday afternoon (a day and a half into the event), we had to stop giving them out, so we'd have some left over for the weekend! Rise of the Apostle...in the News! Enjoy my friends...and always keep spreading the Word! BACK FROM THE AOL ABYSS AGAIN! Friends, I've done the impossible again and returned for a second time from the AOL-MESH-TEAM gravyard! What is the moral to this story?...the way the AOL TOS is now set up, (and they confirm this), they do not want ANYONE to use their AOL accounts for ANY TYPE of commerical applications. To give you an idea of how easily they can close your account down, their current TOS, include things like "that if you send an email with a hyperlink to ANY commercial web sites", that is grounds for termination...even if you're just trying to show a friend something you found on the web! How many of you did this in the last week, let alone the last day or two? So this time we'll learn our lesson and work to duplicate all we have saved on their servers and prepare to move on to a more friendly commerical enviroment. And for the lovely person who thought it would be hoot to report my newsletter as spam...ha, ha-ha, ha-ha...haaaaa! Weds. August 13th is the national release date for the third book in the Eye Witness series...Rise of the Apostle (http://www.headpress.info/). To celebrate, we are holding a Texas Release Party on Satuday Aug. 16th at Titan Comics of Dallas...where you can get your copy signed by me, colorist Mike Lagocki and cover-designer David Rodrigues (both of: http://www.artlovemagic.com/). And to make things even more exciting, for every copy of Rise of the Apostle, (or any of he Eye Witness books purchased) I'll donate a copy to the Dallas based Charity, Heroes 4 Heroes, (see: http://www.heroes4heroes.org/). They have worked diligently over the past few years to collect and ship all sorts of entertainment media to our troops in the middle east...and received cudos for their efforts all the way up to commanding Gen. Patraeus! We are encouraging everyone who joins us, to bring an item to donate. So if you have: Comics, Graphic novels, books, recent magazines, Music CD's, DVD's, MP3, players, video games or gaming systems...laying around your house collecting dust, bring in on down and help entertain our men and women serving overseas! To prime the pump a bit more, for everyone who brings something to donate, you'll recieve a FREE exclusive, autographed Rise of the Apostle poster...which is only available at my personal appearances! And if that wasn't enough, Dallas' own Space Gun Studios (www.myspace.com/space_gun) will be on hand to premier their new anthology, Synesthestic. Hope you can join us!~ Contact us with any questions. AOL MESH TEAM did it again! Friends and associates....if you are trying to email me currently at my aol address and get the mail returned, it because the mysterious MESH TEAM is at it again! Because I sent out a group of emails to former purchasers of Eye Witness from our website and one of them (who I'll guess was with AOL) must have sent it to their spam folder....they said I have violated the terms of service...despite this being an opt in list. Understand it does matter if what you mail out is actually spam with these people, but if someone you've mailed to chooses to report it as spam, (because maybe they don't like you, resent your business practices, are having a bad day or just want to create a problem for someone), that's all they need to take this action! As reported previously, this MESH team seems to do this quite often and quite arbritrarily and the AOL member is not even given the chance to answer his accuser (so to speak). The only option you get is to write them a letter. But fortunately this go round I'm a bit better prepared...so while I'll try to get this reinstated once again, but I may just move on. I'll keep you appraised. But until that is determined, please email me at... headpress1@gmail.com ...if you need to get a hold of me or respond to my mail. As a creator and publisher of Christian based graphic novels, I view the world of pop culture and the conventions which worship it's icons as my great mission field. And for those of you unfamilar with this world, Comic Con International, held each year since the mid-'70's in San Diego, is the largest of these events in North American. This last year it drew over 125,000 people over it's 4.5 day run. Comic Con '08 has come and gone....The good? We had our best year EVER at CCI by the number of Eye Witness books we sold and gave out. Since we were doing the world premier of Eye Witness book three: Rise of the Apostle, I assumed we'd be selling mostly copies of it, (since we had had books 1 and 2 there for the last three years), but to my surprise we sold mostly sets of all 3. That is a very true indication that we were attracting new fans to our series, (and Chrisitan works in general), that might not been open to it in years past....as I kept hearing the question, "have you guys been hear before?" So these were people who may have gone by our table in years past without giving my books a second thought. woo--hoo! Also good news was, that I met a group of young people that had traveled from Colorado to come to Comic Con and hand out tracks. This was a mission trip for them! The Bad? It seems like there was less of a presence by Christian creators, (by that I mean indy, small or self publishers...always plenty of closet-christian creators). Of course the Christian Comic Arts Society (CCAS: http://www.christiancomicarts.com/) was there, like always, but I was disappointed to see that Michael Davis and the Guardian Line of Christian comics was a no-show (http://www.theguardianline.com/)! And I know that, since they were suppose to have a booth right across from me. But other than that, I was unware of any other Christian or spiritual based books being exhibited. But during the annual Sunday Chapel service I put out a call for all those in attendence, (Since I did the sermon), to dig deep over the next year...discover your spritual gifts...and determine how you can use them in God's service. For those in attendence gifted artistically, that could mean more comics, graphic novels, (for the exhibit hall), original art or sculpture(for the art show), indy films (for the film festival), or costumes (just to walk the convention in, or for the masquerade ball). For those gifted for ministry, it could mean walking the room and handing out comic style tracks or maybe having a table for those in need of help. It will be interesting to see how that call in answered over the next 12 months.